← What is the best Japanese Sports Car? Luxury sports cars comprise of two seats & two doors. They are meant for the owner to enjoy their beauty besides acceleration. For that reason, they are unique and their quality must be maintained during transportation. Most racing car owners prefer having their cars delivered to their destinations whether over a long distance or to auto shows in their original condition. Transporting race a new sports cars is not a matter of how expensive the services are but the safety element. A Flatbed Truck is the best way to tow a brand new racing car. This is the most common car towing method today. A flatbed truck uses a long empty bed with some flat top. The flatbed can move upwards & downwards using a hydraulic lift. The car is easily and safely driven up the ramp or even pulled up using an automated winch. Flatbed towing minimizes the risk of damage during transportation. There is no wear and tear since your race car wheels are not in contact with the road. This also protects the transmission engine parts, as well as other systems from damage. 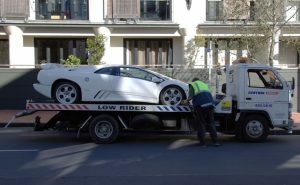 It even reduces any chances of accidents that the towed car could cause by swaying across the road endangering itself, other motorists, and pedestrians. Another advantage of using flatbed truck is the reduced insurance costs given that flatbed trucks are regarded safer. Having the wheels of your sports car not rolling against the road does not mean that the car is 100 percent safe. The road is unpredictable and accidents occur and cause damage even when they are not proximate. Make sure that your car is towed in an enclosed trailer. An open trailer can save you some cash, however, not the best for expensive vehicles. An enclosed trailer provides more protection from unseen occurrences, heat, rain, snow, hail, and hair among other things. Again, know in advance how loading and unloading the car in and off the truck will happen: will they use traditional ramps or a hydraulic lift? For a sports car with some low ground clearance, a low ground loading facility should be used. One more thing, it is always important to be present during the loading and unloading of your sports car from the truck whenever possible.